Rheology Modifiers Market size was USD 4.94billion in 2015, and is anticipated to grow at a CAGR of 3.7%. Global rheology modifiers market is primarily driven by booming paint & coatings industry. Global paints & coatings industry was valued more than USD 130 billion in 2015 and is projected to touch USD 210 billion by 2024, with estimated gains more than 5% CAGR. These modifiers play a significant role in paints & coatings application by controlling the flow characteristics to obtain the desired appearance. When added to paints, they enhance properties such as emulsion stability, anti-sagging, and leveling. Also, these modifiers are primarily employed to maintain consistency and increase the paints durability, particularly water-based paints. Furthermore, growing infrastructure, rising population and rapid urbanization will significantly propel rheology modifiers market size in the next few years. The global personal care industry was valued more than USD 580 billion in 2015 and must reach USD 790 billion by 2024, at 3.5% growth. These modifiers are employed in majority of personal care products including various skin care and hair care products such as shampoos, conditioners, skin creams and body lotions. Improved lifestyle along with increasing disposable income of customers in economies such as India and China will propelpersonal care products consumption. This, in turn, is projected to boost industry growth over the forecast timeframe. These are also employed in pharmaceutical industry for various semi-solid formulations such as ointments, creams, lotions, syrups and gels.Increase in aging population, lifestyle changes and improvement in health care facilities in China and India are boosting the pharmaceuticals industry, consequently propellingrheology modifiers market size. These are employed in adhesives & sealants to enhance their application properties of water-borne, solvent-borne, UV-cured and high-solid systems. For instance, fumed silica, hectorite and polyether polyol associative thickeners are primarily used in the adhesives & sealants industry. The global adhesives & sealants industry was valued at over USD 45 billion in 2015 and is forecast to exceed USD 70 billion by 2024. Fluctuating crude oilprices has been a major factor influencing commodity chemicals cost and various raw materials employed in the product manufacturing. Crude oil is the basic raw material used to produce various types of raw materials for the rheology modifiers synthesis. Therefore, fluctuating crude oil prices is estimated to be key factor influencing rheology modifiers market price trend. In addition, declining printing ink consumption due to increasing consumer preference for digital media such as internet, electronic publications, e-books and e-papers has hampered the printed newspapers, published books, catalogs and other printed material demand. Organic rheology modifiers market size is projected to expand at over 3.5% CAGR by 2024. These are primarily employed in paints & coatings, pharmaceuticals and construction to maintain the desired consistency of end-user products. Different types of rheology modifiers considered under the organic type of rheology modifiers includepolyurethane, microcrystalline cellulose, acrylic polymers, xanthan gum and guar gum. Among inorganics,organo-clay and silica based are the most commonly available products. Additionally, organo-clay based include hectorite and bentonite. These are largely used in personal care and paints & coatings industries. Precipitated and fumed silica are commonlyused as rheology modifiers inadhesives & sealants and pharmaceuticals industry. 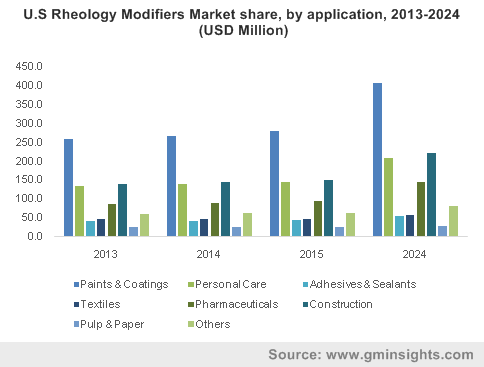 Rheology modifiers market share for paints & coatings generated revenue more than USD 1.5 billion in 2015. These are the major constituent of paint additives. Robust growth in automotive and construction industries is driving the industry growth for paints & coatings applications. Personal care application is projected to expand at over 3.5% by 2024. Rising awareness about personal care and hygiene among consumers is boosting the demand for personal care products across the globe. This, as a result, is significantly driving rheology modifiers market size. They offer excellent stabilization, consistency and suspension properties which makes them desirable across personal care product applications. North America, led by the U.S rheology modifiers market share, was valued at over USD 1 billion in 2015. Regional growth was primarily propelled by increasing personal care productsdemand due to rising awareness among consumers. In addition, the U.S has the highest aging population, which ultimately drive the industry growth for pharmaceutical application. Asia Pacific is forecast to witness highest gains more than 4% CAGR. Increasing construction spending accompanied with robust demand in automotive industry will propelled rheology modifiers market size over the forecast timeframe. For example, China’s construction spending was valued more than USD 1.7 trillion in 2015. Global rheology modifiers market share is highly fragmented with top five industry participants accounting more than 20% of global share in 2015. DOW Chemical Company, BASF SE, Ashland, Lubrizol Corporation and Arkema Group are the prominent industry participants. Raw materials employed to manufacturethese modifiers include carboxylic acid, acrylic acid, bentonite clay and quartz. Global companies such as Evonik Industries AG, The Dow Chemical Company, and BASF SE are backward integrated; they manufacture both the final product and raw materials. Rheology modifiers, as the name suggests, is a material which when added to a fluid composition alters or modifies its rheology as desired. It plays a vital role in rheology control of fluids in end-user industries such as paints & coatings, personal care,pharmaceuticals, adhesives & sealants, pulp & paper and construction. These are employed in almost every product that is used in day-to-day lives, right from food to personal hygiene products. These are used in various food products such as ketchups and juices; pharmaceuticals such as ointments and creams; cosmetics; paints; asphalts; and lubricants. In addition, itis used in black liquor form during the processing of paper in the pulp & paper industry. In personal care products, rheology modifiers are employed to precisely control the fluidity characteristics in products. Cosmetic creams, lotions, nail polish and liquid make-up contains rheology modifiers to achieve desired application characteristics. Rheology modifiers aids inviscosity,foaming properties and stabilize surfactant systems for personal care products.